Operation: Our mill is set up permanently at home. 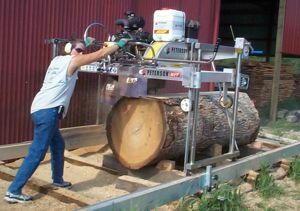 We have a 32 inch bandsaw that we use on logs 30 inches in diameter and smaller. The Peterson mill is used for larger logs. 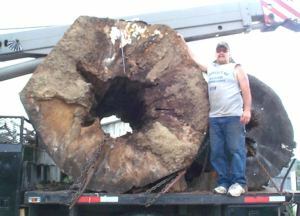 We mill logs that are salvaged from local tree services. We mill more than 25 different hardwoods into dimensional lumber used for cabinets, furniture, flooring and many other uses – which is for sale to the general public. We also cut a wide assortment of turning material. We do a lot of custom sawing and drying of other peoples’ logs.We have a Nyle dehumidification kiln that holds 2500 board feet at a time. 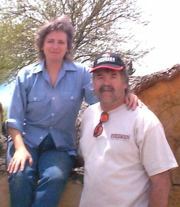 We have also been selling online, which has been extremely successful. Best feature: The Peterson makes quick work of oversized logs. In the past I had to use an Alaskan Chainsaw mill to cut the big logs down small enough to get them on the bandmill, then take the pieces and wrestle them on the mill. This would sometimes take an entire day for one log, but the same log now takes a couple of hours at the most. Also, quarter sawing is a snap with the Peterson. Tip: Don’t overlook the lesser known hardwoods such as hackberry, locust, box elder, catalpa, etc. The stranger the species, the more people will pay for it! Motto: Hard work does pay off. 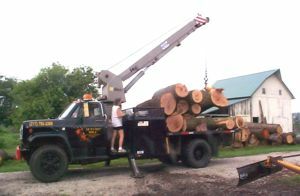 Taking a delivery of logs at the Allen’s place. Mark is standing next to a giant Tulip Poplar log, ready to be milled.